Researchers and weirdo spider enthusiasts are looking to Guam for a peculiar and alarming spider infestation. In the last year alone, the spider population in Guam has grown by 40 percent. This is due to more than just reproduction and a hospitable environment, though. It seems the spiders are getting some equally creepy help, as they are being protected from their primary predators. 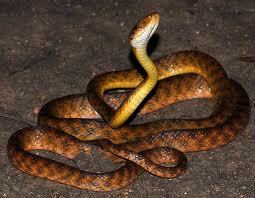 A brown tree snake practicing his bird-callSpiders have the brown tree-snake to thank for their population boost. The brown tree-snake, a species of which was not originally native to the area, has nearly wiped out the bird population in most regions of Guam. The fact that these snakes are also growing in population doesn't bode well for birds, either. And since birds are responsible for the killing/eating of most insects, this has left the spider community free to do as it pleases... namely taking over Guam. As researchers and scientists will tell you (with a shudder, no doubt), it is hard to walk anywhere in Guam without having to brush aside a spider web. As a matter of fact, the spider web to bird-poop-on-cars ratio in Guam is downright spooky. It is why Guam has become of such interest to environmentalists: it is being gauged as an example of what the loss of bird populations in natural forests could do to the environment. The answer, apparently, is welcoming in lots and lots of spiders. This Crow Rocks! The Animal Video of the Day!! !